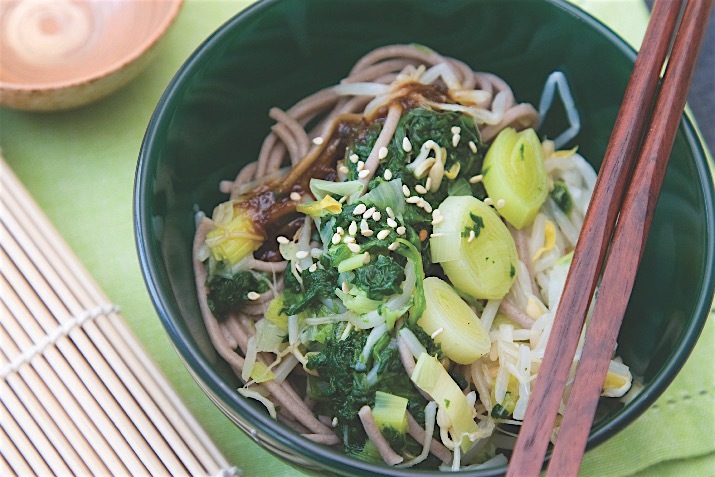 A spicy, garlicky, ginger sauce over wilted spinach, beans and soba noodles makes for a quick and tasty weeknight meal. Cook the soba noodles according to the package directions. Drain and set aside. In a small bowl whisk together the garlic, ginger, sambal, tamari and vegetable broth. Set aside. While noodles are cooking, heat a large skillet with the 2 tablespoons sesame oil over medium-high heat. Add the leeks and sauté for 5-7 minutes until soft. Add the sauce, spinach, and black beans and continue cooking until the spinach is wilted. Add the noodles, toss together and serve hot. Accompany this toothsome main dish with spring rolls or rice crackers, or for a quick and easy an Asian-style soup, just place in serving bowls and spoon in some heated veggie or chicken broth.